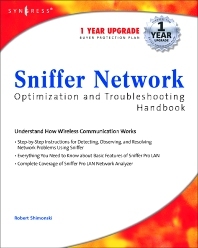 Sniffer Network Optimization and Troubleshooting Handbook introduces the reader to the vast functionality of the suite of Sniffer Solutions from Network Associates but ultimately focuses on the affordable and most widely used Sniffer Product - Sniffer Pro LAN Network Analyzer. This book begins with the basic features of Sniffer Pro LAN and then moves the reader through the impressive tips and tools available for gathering data, analyzing, troubleshooting, resolving and securing problems on their network. Sniffer from Network Associates is a suite of tools including Sniffer Portable Analysis Suite, Sniffer Distributed Analysis Suite, Sniffer Reporting, Sniffer Optical, and Sniffer Wireless. With a clear market leadership, Sniffer Solutions are employed in over 80% of the enterprise networks of the Fortune 100. Sniffer has also received wide industry acclaim from the experts and its everyday users. In 2000 Sniffer was named one of the 10 most computer products of the decade by Network Computing Magazine. It also received the "Editor's Choice" award from PC Magazine during the second quarter of 2001. Over 60,000 individuals have taken advantage of the educational services offered by Sniffer Technologies - aptly named Sniffer University. Coupled with the introduction of the Sniffer Certified Professional Program (SCPP) as a replacement for the popular CNX (Certified Network Expert) certification, an aptitude with Sniffer Solutions is a "must-have" for system administrators.